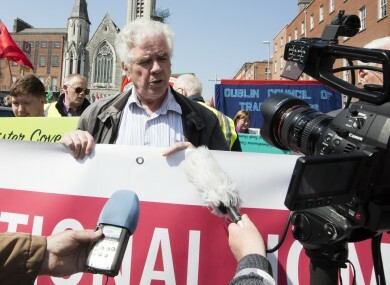 FATHER PETER MCVERRY has said that there is no chance that hotels will no longer be used to provide emergency accommodation for homeless families by the beginning of July. Speaking to Ivan Yates on Newstalk, McVerry said that Housing Minister Simon Coveney is a “good man” but that the problem of homelessness is now “out of control”. The homeless campaigner said that it is clear that Coveney’s proposals to alleviate the homelessness crisis “are just not working”. As recently as March, Coveney has reaffirmed his commitment to ensuring that hotels will no longer be used to house homeless families by July of this year. The use of hotel and B&Bs to house homeless families has skyrocketed over the past number of years and the homelessness crisis has worsened in Dublin. Latest figures from the Housing Department show that there 1091 homeless families with 2,046 children staying in emergency accommodation in Dublin in April. The overwhelming majority of these were staying in private hotels or B&Bs at a huge cost to the state. Dublin City Council spent €40 million trying to house homeless families in hotels and B&Bs in 2016 alone. Coveney first committed to ending the use of hotels to house homeless families by the middle of this year last summer in the Government’s Rebuilding Ireland Housing Action Plan. Charity experts expressed serious doubt that this being possible at the time, however Coveney today remained resolute that the goal could be achieved. McVerry began by saying that getting homeless families out of hotels is “not going to happen by the first of July, that’s for sure”. He began by praising Simon Coveney, saying he had “a lot of respect for him” and that he had “tried very hard to address this problem”. The Minister has produced very detailed comprehensive proposals to solve the problem but he produced those eight/nine months ago and the problem continues to get worse, so to my mind they’re just not working. So I think the problem out of control. He said that the problem was primarily in the private rental sector with families made homeless either because “the rents have gone through the roof and they can no longer afford them”, “the banks have repossessed the home that they’re living in” or “the landlord wants to sell the house”. Introducing caps on rising rents in line with inflation and legislation to prevent evictions would go some way towards alleviating the problems in the private rental sector, he said. McVerry added that is essential that the government find the means to convert the empty houses and apartments around the country into available housing. Advocating going down the “compulsory purchase route” of these empty units, he said “it’s that sort of radical action… that we need to solve what I believe is a problem that is now out of control”. It’s absolutely absurd. This is like the famine times. People were evicted onto the street because they couldn’t pay the rent. This FactCheck, from TheJournal.ie, examined an earlier claim from McVerry that there was more people homeless in Ireland now than at any point since the Famine. We rated the claim “mostly false”. Read: Explainer: How does a homeless family end up having to present at a Garda station for shelter? Email “Coveney's aim for no homeless families in hotels by July? Not a chance says McVerry”. Feedback on “Coveney's aim for no homeless families in hotels by July? Not a chance says McVerry”.